Preheat oven to 200°C (400°F). Place the potato, marjoram, pecorino, salt, pepper and duck fat in a large bowl and toss to combine. 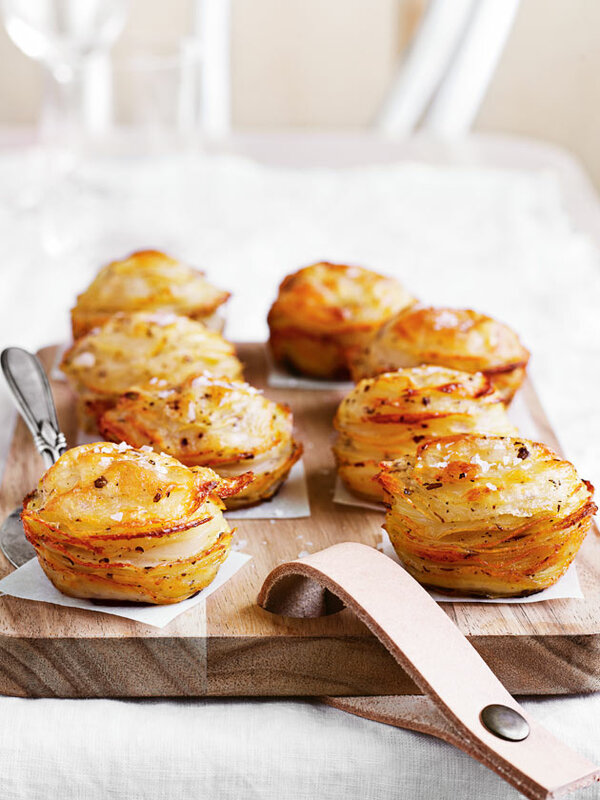 Divide the potato between the holes of a lightly greased 12 x ½-cup-capacity (125ml) muffin tin+. Cover with non-stick baking paper and aluminium foil. Cook for 30 minutes. Remove the foil and baking paper, reduce oven temperature to 180°C (350°F) and cook for 20–25 minutes or until golden. Run a sharp knife around each stack and turn out. Sprinkle with salt and pepper to serve. Makes 12. + The potato will sit slightly above the rim of the muffin tin holes, but will shrink as it cooks.